I am delighted to say that the parliamentary debate held on 4th September was well attended by cross-party Members of Parliament supporting the campaign for a ban on the sales of puppies and kittens in pet shops. Most MPs made comment to the unusually high number of constituents who had urged them to take part and fight our corner, and this is down to you. You should be proud of yourselves because, without you, this debate would not have had such strong MP support. Throughout the debate, a united message was echoed by all MPs that we are a nation of animal lovers and it is disgraceful that puppy farming has been allowed to flourish throughout our country. MP’s raised a multitude of issues that surround puppy farming: the development of heath and behavioural problems due to mistreatment and inbreeding; inhumane welfare conditions; premature weaning; high emotional and financial costs to puppy owners; income tax evasion; over population; and the contribution to the dangerous dog problem. There were also many arguments put forward as to why a ban should be implemented on the sale of puppies and kittens in pet shops. MPs highlighted that pet shops are known to buy their ‘stock’ from puppy farms, both in the UK and Eastern Europe, enabling puppy farming to flourish and the possible introduction of rabies and other diseases from abroad. 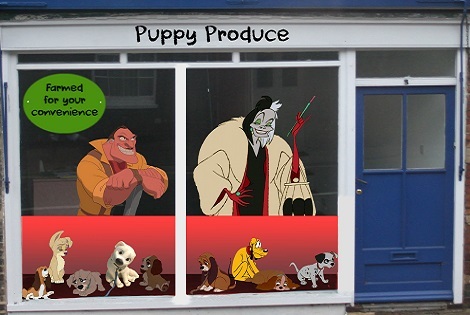 As such, many puppies bought from pet shops are affected by health and behavioural issues, plus pet shops are widely known to encourage impulse purchases, both resulting in subsequent abandonment. MPs also highlighted that puppy farmers are undercutting responsible and ethical breeders, and third party retailers are fooling the public into believing their puppies are bred responsibly when they’re not. A comparison was drawn between choosing a puppy from a pet shop as if they are a commodity, and the rigorous rehoming process involved in purchasing a dog from a rescue centre or reputable breeder. Rob Flello MP warned that without intervention, Britain is at risk of becoming a nation that perceives “disposable pets” as acceptable. A number of MPs highlighted the limited resources available to local authorities for effectively enforcing the existing dog breeding legislation. As such, the public have little faith in the licensing and inspection process. MPs offered a range of solutions for the Minister, George Eustice, to consider. Many MPs were in agreement that a ban alone on the sale of puppies and kittens from pet shops will not be a panacea to the problem of puppy farming, but would be a good starting point. Any new legislation or modernisation of the existing legislation would need to be backed up by cultural change that demands a multifaceted programme involving the collaboration of the government, local authorities, animal welfare groups, vets, and the puppy breeding and vending industry itself. There was strong support for a public awareness campaign to teach the public how to recognise a breeder as ethical and know what questions to ask; ultimately supporting Pup Aid’s “Where’s Mum?” campaign. MPs highlighted the importance of changes to consumer behaviour, informing of them best practices and helping them to become self-regulated. There was also strong support for the government to supply local authorities with resources to help them better enforce the dog breeding regulations and bring consistency throughout the country. Random unannounced inspections were recommended, with a zero tolerance to any violation of the laws. One MP recommended a survey be carried out to all local authorities in order to ascertain where the system is failing and how it can be remedied. Some MPs commented on their local authority’s good practices and the importance of dissemination of helpful information to other local authorities. Ultimately, MPs all recognised the need for the licensing and inspection regime to be refreshed and improved, with well-trained enforcement officers that the public can have faith in to stamp out cruel practices and only license reputable breeders. As in all good debates, there were a couple of MPs who did not support the ban on the sale of puppies and kittens from pet shops. The reason being that it would encourage people to gravitate towards online purchases instead of using licensed pet shops that are subject to inspections. Parliamentary Under Secretary of State for Farming, Food and the Marine Environment, George Eustice concluded the debate with an agreement that existing legislation could be improved. In an effort to prevent the spread of disease entering the UK and the importation of unhealthy puppies, he stated that as of December 2014, a new regulation will be enforced that requires all puppies to be 12 weeks or older before they can be vaccinated. It then requires puppies to remain in residence for a further 3 weeks before it can be transported, which means that any imported puppies will be properly assessed for disease and at least 15 weeks of age before they can enter the country. Mr Eustice was pleased to announce that since the government’s collaboration with the Pet Advertising Advisory Group (PAAG) to create a voluntary code on moderating adverts in early 2014, over 100,000 online adverts have been removed. The Minister promised to see that all local authorities would receive guidance on legislation to inform them of the proper interpretation of the ‘five litter threshold’. It is widely believed that a licence is only required for people who breed five or more litters a year. However, regardless of the number of litters bred, if someone wishes to sell puppies they require a licence. Mr Eustice clarified that local authorities do have the power to restrict which animals can be sold in pet shops. The Pet Animals Act 1951 allows flexibility for local authorities to judge on a case-by-case basis, depending on the suitability of each premises to keep particular animals. Mr Eustice agreed with Mr Robinson MP that existing regulations can be worked with. As part of that process, he revealed that a 50-page document on model licence conditions were published in January 2014 and made available to all local authorities. The recommendations include standards of conditions required for a dog-breeding licence to be granted, including provisions for social interaction. Also, in September 2013, a document on model conditions for pet vending was published that also include social interaction provisions; stating that at least four times a day puppies should receive socialisation with a human for at least 20 minutes. Mr Eustice concluded his speech by saying that local authorities should use the internet to identify where they have a problem. The new code, developed by the Pet Advertising Advisory Group, states that all licenced breeders should include their licence details on all advertisements in order to highlight those trading without a licence number. In response, Rob Flello pointed out that the Minister made some good points, but they didn’t address the “where’s mum?” issue and the fact puppies are separated from their mum too early, which were central to the debate and the reason pet shops should not be allowed to sell puppies or kittens. On a lighter side, MPs took delight in mentioning their own pets’ names during their speeches, securing their legacy in the parliament’s historical records, Hansard.